When in doubt, just clean your face with a bar of soap, right? If you truly want a deep cleansing, one that doesn’t dry your skin (like bar soap), then it’s worth giving face masks a try. You don’t have to use them daily and they can easily supplement other skin care products in your arsenal. Face masks – including the best face mask for men, the FiveVine Activated Charcoal Mud Mask – aren’t just for women. Far from it. So, put down the bar of soap gents and get serious about washing your face. Choosing a face mask is a bit of a challenge, especially given all the options available. Plus, face masks are new to many men who a few decades ago never imagined they’d one day even consider purchasing or using one. Don’t be intimidated, however. It’s a new world, but we have your back. Knowing your skin type is crucial to choosing so many skincare products; what works for another man may produce less-than-stellar results for you simply because your skin is different. The good news is that it’s not all that hard to determine your skin type and, when in doubt, you can always consult a dermatologist. But we’re confident you can figure it out on your own. You’ll know you have dry skin if it’s flaky, exceptionally dry, or cracks easily. It all comes down to your skin sapping up the oils and moisture it naturally produces. Harsh weather conditions, such as the dead of winter, can exacerbate the problem, as well as other factors. Shop for facial masks that have moisturizing ingredients, such as hyaluronic acid and ceramides if you have dry skin. Men with oily skin often have a light sheen on their face; one that may look slightly greasy. It means that your sebaceous glands are on overdrive while producing natural oils at a rate faster than your skin can absorb them. Unlike for men with dry skin, look for facial masks that have fewer moisturizers but work to control oil production and shine. Clay-based masks often work best for men with oily skin. 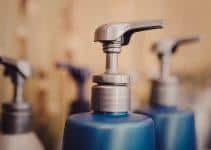 Sensitive skin is susceptible to irritation, including when you’re shaving, and facial masks that include ingredients which don’t prolong irritation (be wary of alcohol-based moisturizers) are a safe bet for men with this skin type. 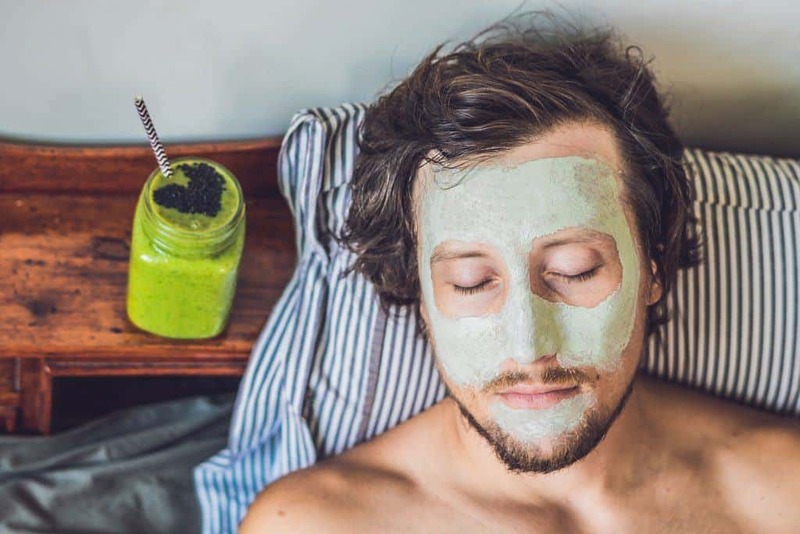 Men lucky enough to have normal skin – which represents the middle ground between dry and oily skin – can safely choose and use a variety of facial masks. If your face is dry in some places and oily in others, then you have combination skin. Acne isn’t just for hormone-flooded adolescents. Many men continue to suffer from bouts of acne long after they emerge from puberty and using the wrong type of facial product can inflame the problem. Many dermatologists recommend using face masks that contain salicylic acid to decrease oil production and to help prevent clogged pores. It’s always wise to peruse a product’s list of ingredients whenever you shop for skincare products. For one, you want to avoid additives that may cause allergic reactions when applied to your skin. While that’s not a problem for many men, it always pays to be careful. Common ingredients found in facial masks include collagen, hyaluronic acid, peptides, as well as essential oils. Many masks also contain ingredients such as volcanic ash and charcoal which produce a certain effect. Facial masks available to men include an array of mask types, such as clay masks, charcoal-infused masks, sheet masks, mud masks, etc. While each type works toward a common goal – to give users the healthiest facial skin possible – they often do so in different ways, i.e., some provide extra moisture, others help reduce irritation and inflammation, while others help treat the signs of aging or the effects of excess sun exposure. Another helpful buying tip is always to check the application instructions before choosing a face mask for men. The instructions should include how long you leave the mask on during each application, and whether you should clean your face before and after each use. 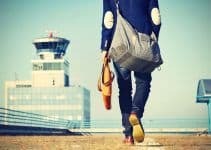 Most of us buy products based on our budget and lifestyle, although there’s nothing wrong with a bit of splurging now and then. Then again, just because something has a higher price tag doesn’t mean that it’s a better product. There are plenty of high-quality face masks for men out there that come at a fair price. On the other hand, there’s nothing wrong with a paying a bit extra for a product that delivers superior results. Next, let’s looks take a look at what we think are the best masks for men in 2019. FineVine’s Activated Charcoal Mud Mask packs a one-two punch because it contains charcoal and mud, both of which are common, highly-effective ingredients found in many skincare products. Activated charcoal – not the kind you put in the grill before a weekend barbecue, mind you – draws bacteria, chemicals, toxins, oil, dirt, and other impurities from the skin. Meanwhile, mud (and clay) helps to hydrate the skin while also drawing out skin toxins and impurities. 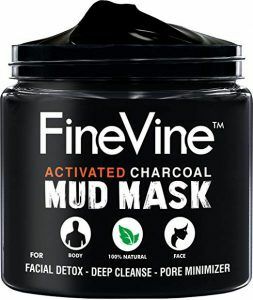 So, FineVine provides the many skin-healthy attributes of charcoal and mud in its Activated Charcoal Mud Mask, which we think is the best face mask for men. It helps to unclog your pores, it removes dead skin cells, it fights acne and helps reduce acne scars, it reduces age-related issues such as fine lines and wrinkles, and it’s safe for every skin type. 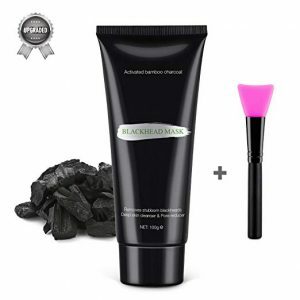 The Activated Charcoal Mud Mask isn’t only effective on facial skin, either; you can use it on your body, feet, hands, neck, nose, etc. 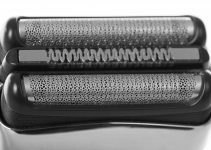 It promises to remove toxins and improve blood circulation no matter where you use it. It’s also packed with natural ingredients that won’t irritate or inflame the skin. No matter your skin type or skin issue(s), ActiveVine’s Charcoal Mud Mask has you covered. And it’s not just for your face, either. The Dead Sea conjures up many images, from important religious figures to long-ago societies to iconic religious documents. The mud from the Dead Sea? Well, not so much, but the stuff has a lot of benefits regarding skincare. It comes down to this: the Dead Sea, which is actually a saltwater lake located in the Middle East between Israel and Jordan, has the lowest sea level of any body of water on earth. It’s also surrounded by mountains. The combination of the two makes the Dead Sea’s mud rich with minerals such as potassium, magnesium, and sodium, and they’re minerals that come with many health benefits – including that they reduce skin impurities by helping to draw them away from the skin. Which brings us to New York Biology’s Dead Sea Mud Mask, which is good for treating all types of skin and skin issues, including acne. Its high concentration of sodium and magnesium works powerfully to treat blackheads and other blemishes. The Dead Sea Mud Mask draws out oils and toxins from the skin and cleans pores to leave your face feeling refreshed, exfoliated, and fresh. Its list of ingredients includes an effective herbal complex of chamomile, aloe vera, vitamin A, vitamin E, sunflower and jojoba oil. It helps to tighten skin to give you a healthier-looking complexion. While it provides a powerful punch for treating blackheads and excessively oily skin, it’s also gentle enough for daily use. We think it’s the best men’s face mask for oily skin. It serves as an excellent exfoliator while helping to relieve your skin of dead cells. Also includes shea butter, an excellent moisturizer that helps keep your skin soft, elastic, and firm. You can use it once or twice a week for best results. It’s easy to apply and gently rinses off with warm water. While the New York Biology Dead Sea Mud Mask comes loaded with various natural ingredients, it also contains dimethicone – a silicone that acts as a “smoothing” agent. Whether that’s a big deal for you is, of course, a matter of personal preference. New York Biology’s Dead Sea Mud Mask is the choice of many men looking to improve the overall health of their facial skin. It removes toxins, treats blackheads and oily skin, and gives your skin a healthier, softer feel. Clay is another ingredient commonly found in face masks, including in Rugged & Dapper’s Face Mask For Men. Clay, mud – you may wonder what’s the difference, which is understandable. But there are differences, subtle as they sometimes may be. Generally speaking – very generally – mud serves as a skin-healing agent while clay is more effective for drying skin. The latter makes clay an excellent choice for men with oily skin that’s prone to breakouts (such as acne). On the other hand, Rugged & Dapper’s Face Mask is effective for treating a variety of skin types, not just oily skin, and even provides a bit of hydration. We think it’s the best clay mask for men. Rugged & Dapper’s formula includes Kaolin clay, a common type of clay in many facial mask formulas. It’s excellent for use on oily skin that leads to breakouts. Besides clay, you’ll find many other natural ingredients in the R&D mask, including aloe vera, sea kelp, grapeseed oil, and spirulina (a micro-algae that’s an excellent detoxifier, among many other benefits), as well as a host of vitamins, minerals, and antioxidants. The Rugged & Dapper mask works by drawing out impurities while absorbing the excess oils that can lead to acne, blackheads, and an overly-shiny complexion. It also shrinks and tightens pores to prevent clogging – which also leads to breakouts. Moreover, it provides another line of defense against fine lines, wrinkles, and other signs of aging. While superb for men with oily skin, the Rugged and Dapper Face Mask works effectively on all skin types and men of all ages. 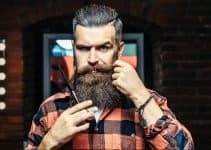 Another thing we think you’ll like about Rugged & Dapper’s Face Mask for Men is that a container of it will last a long time because a little of it goes a long way – you don’t have to slather it on in multiple layers to reap all of its benefits – and one or two applications a week will suffice. Clay is an effective natural ingredient often used in skin care and Rugged & Dapper effectively utilizes clay’s many benefits in its Face Mask For Men. It’s easy to apply and you don’t need to use a lot of it to get great results. Lantique’s Charcoal Peel-Off Mask is another versatile product that’s suitable for a variety of skin types for many reasons, including its wide variety of natural ingredients. It also has an upgraded formula that helps improve upon a product that already was a favorite of many men and women. While we think it’s the best charcoal mask for men, it’s also a highly-rated men’s face mask peel. You simply spread it on your face, let it sit for 15-20 minutes, gently peel it off, and then admire how nice your complexion looks. The charcoal used in this face mask comes from natural bamboo ash and has powerful absorption qualities. It helps to draw out dirt, impurities, and toxins that may lead to blackheads and other breakouts. It specifically targets blackheads that form due, in part, by dirt, oil, and bacteria trapped in clogged pores. It also works to exfoliate the skin by removing dead skin cells. But it’s gentle enough to use on all skin types thanks to a nice mix of natural ingredients, including green tea extract, chamomile, and Centella Asiatica – a perennial herb that’s said to have a variety of health benefits. The Charcoal Peel-Off Mask also comes with a 100% satisfaction guarantee. If you don’t like it, or don’t notice any positive results, you can send it back for a full refund. If your skin is prone to breakouts and blackheads, give the Charcoal Peel-Off Mask by Lantique a try. It effectively absorbs toxins and other impurities that inflame and irritate the skin. There’s no stopping the relentless march of aging. That sounds depressing, true, but that doesn’t mean getting older has to be as pleasant as dealing with a yard full of rattlesnakes. Many men, after all, age like fine wine and with products such as Alitura Anti-Aging Professional Clay Mask, you’ll help ensure that you’re of a vintage which you and many others savor. Not that this mask fights the obvious signs of aging skin only, like fine lines and wrinkles, because it’s an all-in-one facial treatment that’s effective for all skin types and men of all ages. How does it work? For starters, the Alitura Clay Mask offers a unique blend of nine ingredients packed with nutrients that provide many skin-healthy benefits. The folks at Alitura say it provides an all-in-one “spa-quality” experience that works holistically to regenerate, purify, renew, and detoxify the skin. One of the more unique ingredients found in this mask is kelp, a seaweed that’s a powerful detoxifier while also improving blood circulation to the face which helps to tighten and exfoliate the skin. That’s one reason why we think the Alitura Anti-Aging Clay Mask is the best exfoliating mask for men. It also restores minerals depleted by skin damage, or excess sweat and oils. Among the natural ingredients found in this mask’s formula are freshwater pearl powder, vitamin C, ginseng, colostrum, as well as three different types of clay. Vitamin C has many antioxidant properties and it plays an important role in collagen synthesis. Collagen is the main structural protein found in the skin. Pearl powder contains a substance called nacre which aids with the formation of new skin and collagen and also helps in wound healing. Colostrum provides many skin care benefits, including as an anti-aging agent. And ginseng helps purify the skin’s pores. There are a couple of things to keep in mind about this mask, however; 1) it costs more than most masks, and 2) its application takes more time because you have to mix the compound with water to prepare the mask. That said, many, many users willingly pay the higher price because of the quality results they’ve come to expect from this product. 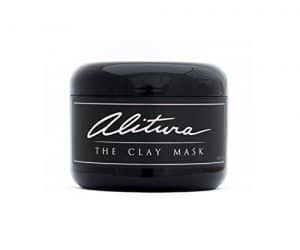 If you’re willing to spend a little more of your hard-earned cash for a top-quality mask, then you should try Alitura’s Professional Clay Mask. Whether you want to fight signs of aging, or want a deep cleaning, exfoliating treatment, this mask will work for you. Beau Brummell was a distinguished, refined English gentleman with a sixth sense for fashion, as well as some serious mojo for grooming. Legend has it that Mr. Brummell spent five hours a day on his grooming and inspired many men to do things that we take for granted today, such as bathing and shaving daily, wearing fragrances, etc. Not that we advise anyone to spend that much time grooming every day, but we appreciate the spirit and legend represented by Brummell’s lifestyle. And Beau Brummell’s skin care tries to capture that spirit in everything it does, including in the manufacture of products such as its Men’s Face Mask. 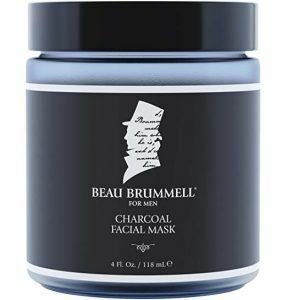 The Brummell masker for men includes both charcoal and kaolin clay and provides a deep cleaning which effectively fights blackheads and acne (we can only imagine that the actual Beau Brummell wouldn’t have been caught dead with blackheads). This mask fights breakouts by helping to eliminate toxins and oils, while the kaolin clay and charcoal work together to provide deep cleaning and exfoliation. It also tightens pores, which helps to keep dirt, oils, and other grime from re-entering the skin. Tightened skin means fewer fine lines, wrinkles, and other obvious signs of aging. Beau Brummell’s Men’s Face Mask has an organic fragrance that, unlike many synthetic fragrances, doesn’t clog pores or cause skin issues. We think you’ll like the scent, which is natural and doesn’t overpower the senses. Beau Brummell specializes in men’s skin care and that commitment is evident in its Men’s Face Mask. The combination of clay and charcoal effectively removes impurities and toxins that can lead to skin breakouts. There’s more to using a face mask than slapping the product on and removing it within the suggested time frame. Not that it’s a complicated process like, say, defusing a bomb, but there are some rules to follow. True, face masks are all about removing excess crap from your skin, including dirt and grime, but it’s important to start with a clean base before applying your mask. Doing so also helps the mask’s ingredients penetrate more deeply into the skin while improving the chances of getting the results you desire. It’s also a good idea to clean your hands with soap and water before you begin, as well. There’s no sense in applying a facial mask with dirty or oily fingers. When you’re finished cleaning your face, pat it dry (don’t rub!) with a soft towel that doesn’t irritate your skin. This step isn’t mandatory, but it is helpful: take a warm, wet towel, such as a hand towel, and lay it on your face for five minutes. The warm moisture helps open up your skin’s pores and, in turn, make it easier for your facial mask to provide a deep cleansing. Apply generous portions of your mask to your face and neck areas. Be careful around your eyes; unless you’re using a mask intended for your eyes it’s best to leave that area alone altogether. Take the time necessary for your mask to dry thoroughly. Most masks take between 10 to 15 minutes to dry and harden. There’s no reason not to take advantage of this time, man – kick back, close your eyes, put on some smooth jazz, meditate, whatever! Just be still. Chill. Using a fresh warm and wet towel, gently remove the facial mask with small circular motions. Splash an extra bit of warm water to remove any residue that’s left behind. Gently pat dry your face with a soft cloth. Again, don’t rub your face with a towel to dry it, but pat various sections of it dry before moving on to the next section. A good way to finish your facial mask routine is by conditioning your face with a quality toner or moisturizer. Doing so helps hold the mask’s beneficial ingredients on and in your skin, while also offering another dose of moisture. While face masks may tip the scales in favor of your skin looking its best, or not, they’re not the only facial skincare game in town by any means. As with any aspect of your grooming routine – beard, face, body, etc. – it’s to your benefit to have as many tools at your disposal as possible. The type of mask may vary regarding its application: some will dry and harden on the skin before removal, while others will dry to a certain point before being pulled off. Others don’t dry much at all and you only need a gentle rinse with warm water to wash them off. While face masks aren’t for every man, they’re effective enough for everyone, if that makes sense. If you can get past the “it’s a woman’s product” frame of mind (if you have that mindset, that is), you might find yourself with healthier facial skin that you previously thought was possible. Some creams target the outward appearance of aging skin: wrinkles, brown spots, dark circles, tired-looking skin, and so on. Anti-aging creams and moisturizers contain a boatload for antioxidants, vitamins, and free radical fighting ingredients. Daily face cleansers and washes are better than your regular bar of soap – the one you just used to scrub your body and other parts. Regular soap can dry out your facial skin, which is different than the skin on other parts of the body, and can transfer bacteria and other nasty stuff to your face. You’ll find cleansers for all skin types, from normal to oily to sensitive. Scrubs work well for exfoliating the skin and should be used once or twice a week for deep cleaning. Scrubs have a grittier formula than other skin care products and provide rigorous cleansing, not unlike facial masks. Gels are lightweight, have a less-greasy feeling than other moisturizers and cleansers, and feel cooler on the skin. They use water, alcohol, or liquid fat to disperse their ingredients. They mainly serve as a moisturizer and not a cleanser. Face lotions aren’t as heavy as creams and primarily provide moisture rather than deep cleaning. Face masks come in several types and with a variety of ingredients, and our goal was to include products which reflected that diversity. We also wanted to list quality masks that worked on the many different types of skin while offering many different benefits – from reducing impurities that lead to breakouts to adding needed hydration for men with dry facial skin. We also considered the reviews of others, especially the reviews of customers, while also being conscious of other factors, such as price. You often get what you pay for, but sometimes even more for your money. We’d love to hear from you. Do you use face masks? If so, what’s your favorite brand and type? Have you used any of the products listed here? We always welcome your feedback.